REC extends CSR support for 1.31 crore to the Research and Extension Association for Conservation Horticulture and Agro-Forestry (REACHA) for the project, improving learning outcomes in primary education to 3000 children (studying in govt. schools) through project based learning with focus on multiple reinforcement in Atraulia block of Azamgarh district of Uttar Pradesh for F.Y 2017-18. Rural Electrification Corporation Limited (REC), A Govt. of India Navratna Enterprise, committed financial assistance under CSR initiative to REACHA for the project, improving learning outcomes in primary education to 3000 children (studying in govt. schools) through project based learning with focus on multiple reinforcement in Atraulia block of Azamgarh district of Uttar Pradesh through its CSR arm, REC Foundation. The main objective of the project is to improve access, retention and learning outcomes for children in the age group of 6-14 years so that they receive quality education at elementary level, to enroll and mainstream residual out-of-school children from the disadvantaged and marginalized social groups residing in rural villages and urban slums, to improve retention in schools and lower the dropout rates, to improve teaching quality in schools and to improve learning outcomes as per indicators developed and ensure age-appropriate learning levels through supplementary and remedial coaching. The Memorandum of Agreement (MoA) in this regard was executed between REC Foundation and REACHA in New Delhi on 29.01.2018 in presence of Shri Sanjiv Garg, CEO, REC Foundation. 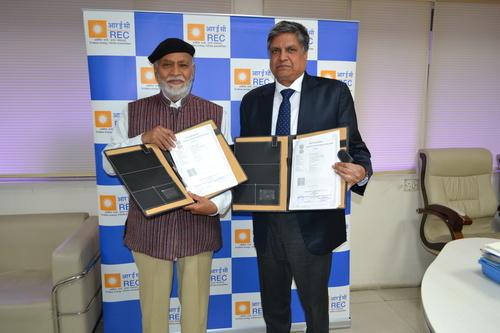 Shri Rajpal Singh, DGM, REC, on behalf of REC Foundation and Shri J C Pant, Chairman, REACHA signed the MoA in the presence of other officials of REC and REACHA.